Norman Finkelstein Wishes Genocide of American Jewry and Gives Nazi Salute In Danish Documentary……. – The Tundra Tabloids……. Norman Finkelstein Wishes Genocide of American Jewry and Gives Nazi Salute In Danish Documentary……. Last night the Tundra Tabloids’ was watching a late night Danish documentary on Finnish TV, directed by an Israeli, Yoav Shamir, titled “Defamation“. The ADl, Anti Defamation League was approached for assistance on the documentary, but were not impressed with the results. After watching the documentary, I came away with the very exact same opinion as the ADL, it totally missed an opportunity to explore both kinds of anti-Semitism, the Judeophobia leveled against individual Jews and communities around the world, and to a great extent, the level of absurd, irrational criticism leveled at the Jewish state of Israel, the very kind that Norman Finkelstein represents. Instead of doing that, it more or less took to belittling the work of the ADL, down played the significance of remembering the Holocaust, as well as giving a very large platform to Israel’s critics who push the canard of the all powerful Jewish Lobby controlling US politics. 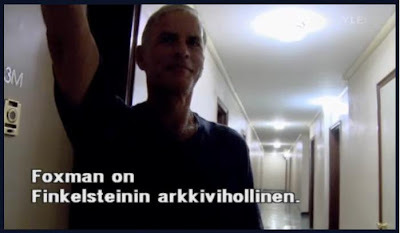 It’s no wonder that Finnish TV aired that documentary, though they have yet to aire “Jenin: Massacring Truth” by Martin Himmel, of an Israeli soldier who fought in Jenin and wanted to confront the journalists in the BBC and elswhere who branded him and others as “war criminals”. No, the Finnish state broadcastors have no time for any such hard hitting documentary as that. Norman Finkelstein’s luck was to be born (in 1953) to parents who had survived the Holocaust. With audacious perversity, Finkelstein has drawn upon this birthright in legitimating the anti-Semitism that he has perfected into something like a nightclub routine in his appearances on the college speaker circuit. A political scientist who has made a point of specializing in the Arab-Israeli conflict, Finkelstein has been a faculty member at Brooklyn College, Rutgers University, Hunter College, New York University, and most recently, DePaul University, where he was an Assistant Professor from 2001 to 2007. When he was recruited by DePaul, he had recently been fired from two New York-area adjunct teaching jobs (NYU and Hunter College) because of his lack of substantive scholarship and his obsessive rants against Jews and Israel. In June 2007, Finkelstein was denied tenure at DePaul. From time to time, Finkelstein speaks at events sponsored by chapters of the Muslim Student Union and the Muslim Students Association, where his anti-Israel animus has made him a superstar. In October 2005, Finkelstein was a special guest speaker at Yale University, where he delivered a speech titled “Israel and Palestine: Misusing Anti-Semitism, Abusing History.” In that address, according to a report in the Yale Daily News, Finkelstein derided Jewish Americans for their high “level of mental hysteria” about Holocaust denial. He asserted that the phenomenon of the so-called “new anti-Semitism” had been fabricated out of whole cloth by Jewish organizations. He made numerous references to the “Jewish lobby” that was allegedly manipulating U.S. foreign policy. And he depicted the Arab-Israeli conflict as a “simple one” rooted in what he called Israel’s long history of ethnic cleansing and egregious human rights violations. Notably, he did not once use the words “terrorists” or “militants” in describing the Palestinian side. Next Post Next Post US: Former Muslims United Organization Petition U.S. Commission on Civil Rights and Attorney General…….